You can learn to use the power of your soul and support from the higher dimensions to create important shifts in various areas of your life. In each journey, Theodore works with you and your soul to assist you in opening to a smoother, more joyful and flowing path of growth. Theodore is often joined by many high beings. They too contribute various forms of light and energy work to enhance your process of awakening. Many have come to enjoy the rich heart openings, the expanded sense of harmony and flow, and the easy access to higher wisdom available through these journeys. In these meditations, Theodore is transmitting soul-quality essence frequencies such as love, fulfillment, clarity, and many others. This transmission actually fine-tunes your energy field so as to strengthen and call forth higher qualities in you. Since he lives in a dimension beyond time and space, Theodore is able to find your energy over the course of time you listen to these journeys. Each time you listen to one of these tapes, you are tuning in to Theodore's transmission of light. 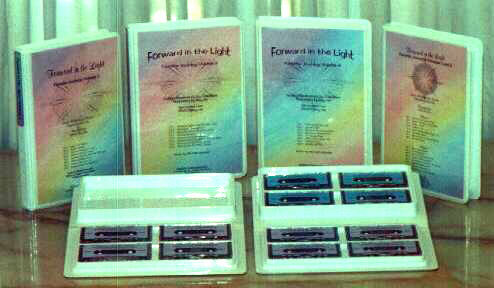 As you continue to work with these tapes you are adding light to your aura, and raising your vibration. Most people find that these tapes tend to "grow with them" in that, as you continue to go higher yourself, you will be able to open to even richer experiences with these journeys. This item has not been added to our shopping cart system. Available on Cassettes only -- not CD. Join with Theodore and your soul to evolve the part of you that can allow love. Receive a message on how to facilitate this shift/opening. Open as Theodore transmits to your heart. Share your light with another person, or put your light into a situation you'd like to uplevel. A special being of refined light transmits the quality of balance, making it easier to open to love in a balanced way. This being helps open your energy as Theodore transmits gifts of love to you. Receive important messages, and share love with another's soul. Step your vibration up to a new energy essence. Send anything within you that is "not-love" up to the Spiritual Sun to be transformed, while the light of the Spiritual Sun fills those spaces in your energy. Theodore transmits to the Jewel in center of your soul's heart. Bring this love into various areas of your life through your chakras (energy centers). Enjoy further play with the Jewel of Light in your heart. Enjoy the beauty, and feel the sweet love transforming your body, evolving your DNA, and releasing blocks. Use this love energy to transform a situation or relationship, with assistance from a high Being of light and Theodore. Blend with the mind of your soul. Theodore transmits to your soul's heart. Move your soul's Heart Jewel into your personality. A Great Being transmits patterns of a fully awakened heart for you to resonate with. Receive a message, and evolve your ability to let your soul work through you. An angelic being works with your energy to enhance your life purpose, and your next steps in the divine plan. Join the will of the higher mind. Bring your soul into your chakras, and experience your soul through them, and through your Vibrational Energy Bodies or Light Body. Meet a Being of light your soul has invited to work with you. Receive a message from the Universal Mind and updated alignment with your part in the Divine Plan. Theodore transmits to open you to more love. Your soul stabilizes your heart at this new place. Share this expanded love with the soul of a loved one. Explore the heart of your soul, as a Great Master assists you in making a shift. The Master, Theodore and your soul form a triangle of light around you to evolve the Subpersonality that's not yet ready for this shift. Connect in the Universal Mind to a source of mastery. Open your heart, receive frequencies of love. Share your light with someone's soul. Theodore, light beings and the Solar Logos transmit to help you blend with your soul and fulfill your request. Sense the love, oneness, and your part in the divine plan. Receive messages about your life purpose. Fill your personality with light. Connect your mind to the Universal Mind. Learn and resonate with the essence energy set-up of a skill you would like to learn. Build that energy into your aura and body. Direct love and high frequencies from Theodore and radiant beings into the blocks you want to shift. Theodore transmits prosperity and abundance. Receive a message from your soul about your next practical steps, and next shift. Go to a place in the Universal Mind to learn something that will assist you. Play light games with Theodore. Share love with someone in the Universal Mind. Five light beings and the Spiritual Sun transmit light to awaken the light in your head, an advanced state of enlightenment. This allows your soul to more fully view and move into an area of your life, giving you answers, insights and refined energy. Allow higher flow to move through you. Bring higher flow to an area of your life. Become the vibration of being blessed, letting the higher light work through you. Call forth your profound ability to FEEL (not just observe) the higher energies. Remove another layer of separation between you and the light around you. Experience joining and riding the flow at a very deep and profound level. Feel being carried along your higher path in the Divine Will. Allow life to work through you. Expand your ability to sense, ride, be and create flow. Open as your angel transmits a particular soul quality it would like to share with you. Receive assistance from your angel with something in your life. Discover how you can most effectively utilize your angel in your day-to-day life. Join consciousness with an angel. Experience this angel's connection to the God-source, as it shares its special gift with you. Receive a message or play with the angel any way you like. Join a group of angels, as they transmit waves of love, clarity, grace, and fulfillment. available either on one Cassette Tape, or on one CD. You can choose your format below. $15 per Cassette or CD, plus $2.00 for shipping and handling. Excellent meditation for letting go of struggle, effort, and the need to control, and developing deeper skill for tuning into and trusting the flow of life. A powerful journey for lifting the unconscious limitations you have on how good you're willing to have it, and how much love you allow into your life. Connect with your soul and Theodore as they work to open you to expanded levels of love. Bring expanded love to your physical and emotional bodies for healing. Bring love into yourself in the area of relationship. Put love into your highest path of light, and experience your love reflected back to you. Find a note of joy within you and allow it to build. Draw to you beings of light to support and enhance your joy. Bring joy to an area of your life that you'd like to uplevel. Receive guidance on how to receive more joy in your life. Experience trust. Open yourself to the ease and effortlessness of letting your soul work through you. Experience life as a soul-infused personality. A powerful journey to bring high frequencies of expansion in the areas of abundance, fulfillment, prosperity, and love. Open your energy through your chakras, and bring in the light of your soul. Open to a high, harmonized, light-filled, flowing state, and bring that beauty into a specific area of your life, to raise the quality of that area. Step up to a new spiritual awareness, and new level of mastery. Connect with the Universal Mind, enhance your life purpose, align your will with your part in the divine plan. Open to a new level of ease in all that you manifest. Receive initiation from a great master of light, & special transmissions from Theodore. Journey to the Temple of the Masters to work with a great master and some beings of light to raise the vibration of your energy and shift to a higher path. Interact with a being of light to help open and expand your radiance. Replace the need to control with deep trust. Enhance your ability to perceive perfection in yourself and others. Become a generator of perfection. Bring perfection energy into each of your chakras. Bring your soul's light into various areas of your being. Transform old beliefs, and expand into the Universal Mind. Bring light to a situation you'd like to uplevel. Find a solution as energy, and bring it into your flow. Tune in and work with your life purpose as Theodore transmits frequencies to empower your life purpose. Note: There is some CB radio interference in the first few minutes of this tape, but it's a very good journey. Lift your awareness to the realms of your soul, noticing the frequencies and patterns there. Be carried by the flow. Receive the frequencies of light that are next for you, and transmissions of light from Theodore. Connect with your soul and a being of light as they smooth out your energy, removing blocks, creating flow. Bring light and smoothness into an area you'd like to create a shift in, and into your mental gridwork and emotional body. Receive a message regarding this situation. Ready for a good laugh? Be willing to lighten up as you meet the Joy Beings. Heal through joy, allowing joy and laughter to clear your aura. Open as an angel-like being plays with frequency and vibration to lift and enlighten your energy. Find your highest path as energy, and place light in it over time, bringing it to a higher level of refinement and beauty. Go high into the soul planes exploring spectrums of light frequencies. Select and bring back those that most enhance your being. Send light out to others through the Universal Mind. Receive a message from your Higher Self.